As violence flared late last month in Kiev after Parliament approved a draconian law against dissent, two of the richest men in this industrial city 300 miles to the east of the Ukrainian capital met in an expensive Italian restaurant that they own and made a fateful decision. The men, Hennadiy Korban and his partner Borys Filatov, decided to remove advertising videos featuring glamorous models from a large outdoor screen at an upscale shopping mall called Passage and replace them with a live broadcast of raucous antigovernment protests at Independence Square in Kiev. 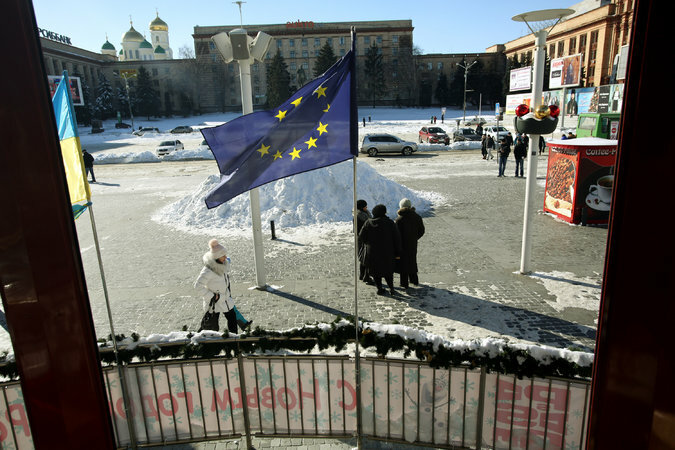 They also ordered their local properties to hoist the flags of the European Union and Ukraine, a gesture of open revolt in a Russian-speaking region where economic and political power have traditionally been united in looking more to Moscow than to Europe for guidance. Retribution, or at least some extraordinarily bad luck, swiftly followed. Hours after the flags went up on Jan. 25, all three of their company’s shopping malls in Dnepropetrovsk lost their electricity, and panicked shoppers scrambled through the dark for the exits. The video screen outside went dark, silencing the antigovernment chants from Kiev and, at least on the surface, restoring Dnepropetrovsk as a bastion of calm support for Ukraine’s embattled president, Viktor F. Yanukovych. Caught in a titanic tug of war for influence between Russia and the West, Ukraine is also being tugged in opposite directions by the forces facing off at the Passage mall in Dnepropetrovsk. In an economy dominated by a relative few wielding enormous wealth, the outcome of the struggle could well hinge on how many other businesspeople make the same switch as Mr. Korban and Mr. Filatov and join the street in rejecting Mr. Yanukovych’s tilt toward Russia. The defection of two provincial businessmen — motivated as much by resentment of the strong-arm tactics of rivals in league with the government as by lofty ideals — will not tip the balance of power in Kiev or even here in this city of more than a million people, its economy dominated by huge Soviet-era factories like Yuzhmash, a rocket maker still owned by the state. But it underscores how a protest movement that the government dismisses as the work of nationalist extremists from the country’s west has reached into Mr. Yanukovych’s political power base in the east and is even eroding the loyalties of those who have thrived under him. And it shows how, for all their differences, the disaffected moguls and the protesters are driven by a deep frustration with what they see as the country’s lawless law-enforcement system and ubiquitous corruption. Both camps call for not just democracy but for a more “normal,” European-style government with transparent institutions, secure property rights and an impartial justice system. Fearing arrest, Mr. Korban and Mr. Filatov fled Ukraine for Israel last week. A Dnepropetrovsk judge ordered on Jan. 29 that Mr. Korban be detained and interrogated as a witness in connection with a previously dormant investigation of a 2012 murder. According to the pair’s lawyers, state security officers then raided the premises of their accountant, saying they were looking for bombs or other evidence of terrorism. They found none, said one of the lawyers, Oleksandr Sanzhara. The businessmen do not regret their decision. “We decided that we had to do something as citizens, to send a signal that not all businessmen are afraid,” said Mr. Korban, an aggressive local tycoon whose interests include a string of hotels, three big shopping centers and stakes in many of Ukraine’s biggest companies. “We want to live in Europe, not in an outpost of the Russian empire,” added Mr. Korban, 43, speaking by phone from Israel. The president ignited the current turmoil in November when he abruptly spurned a sweeping trade and political accord with the European Union and instead went to Moscow to secure a $15 billion credit deal, which has since been suspended. Ukraine’s biggest business moguls, known as oligarchs, have so far mostly hedged their bets, with the exception of Petro Poroshenko, a shipping, confectionery and agriculture magnate whose television station, Channel 5, has been broadcasting around the clock from Independence Square. Others have made cautious, coded statements hinting at discontent with the government and with a new generation of nouveaux riches rivals, including the president’s son, Oleksandr, who have come from nowhere to amass great fortunes. The cracks, however, are caused as much by economic self-interest and clan allegiances as by any idealistic embrace of European values. By openly siding with the president’s opponents, Mr. Korban and Mr. Filatov have exposed the anger of established businessmen against a system that many feel no longer serves their primary interest: protecting their assets. Though publicly declared only recently and cast as a political act, the rupture between the two businessmen and the government began in earnest in May last year with a bitter struggle over a railway switch factory controlled by a friend and occasional business partner of Mr. Korban and Mr. Filatov. The authorities, they say, unleashed a flood of inspectors and urged their friend to sell the factory, estimated to be worth nearly $100 million, to an upstart business rival for just $35 million. After a bruising fight, Mr. Korban’s partner managed to hold on to the plant. “The conflict is over, but the bad feelings remain,” Mr. Korban said. He dismissed his own reputation as a sharp-elbowed corporate raider as a byproduct of post-Soviet prejudice against capitalism and a misunderstanding of how it works. “In America, they call this mergers and acquisitions, not raiding,” he said. When the electricity finally returned to their shopping centers, Mr. Korban and his partner lobbed another grenade at the government. The screen outside the Passage mall lit up with a video of “Swan Lake,” the Tchaikovsky ballet that is indelibly associated with the death rattle of the old Soviet system. The ballet appeared on Soviet television in August 1991 when a clique of hard-line Communists briefly seized power and suspended regular programming. The Soviet Union collapsed four months later. Mr. Korban and Mr. Filatov say Ukraine’s business community has been far more supportive. They said they had received calls offering sympathy and support from tycoons still in Ukraine, including the country’s best-known oligarchs. The local authorities, firmly in the hands of people loyal to Mr. Yanukovych, insist they had nothing to do with the mysterious electricity cutoff at the shopping malls and blame an accident that somehow hit only properties owned by the rebellious local oligarchs. The electricity company blamed faulty “vacuum circuit breakers” for the failure. So far, according to the opposition activists in Dnepropetrovsk, the regional government’s main response to widening discontent has been to sharply increase the risks of disloyalty. The police arrested 24 people who attended a modest opposition rally in the city on Jan. 26 and charged them with “participation in a mass disturbance,” a crime carrying a penalty of up to eight years. The rally, near the regional administration building, turned violent when unidentified men in track suits started beating pro-Europe demonstrators. The administration building is now a fortress, its main entrance protected by riot police officers behind a barricade of icy snow, its lobby strung with razor wire and packed with security officials. The police block all but official cars from taking a nearby road.